Samsung has just announced the launch of its latest ‘Galaxy A’ series smartphone. This smartphone is the Galaxy A70 from the company. Earlier, Samsung released the Galaxy A10, A30 and the Galaxy A50 smartphones in the market. This latest Galaxy A series from Samsung is seen as direct competition to the likes of Xiaomi, Honor and other Chinese brands. 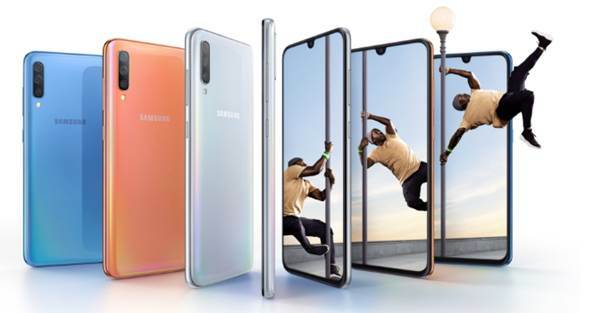 As far as highlights of Galaxy A70 from Samsung are concerned, they are its triple rear camera setup, in-display fingerprint scanner, and Infinity-U display. Apart from that, Galaxy A70 also comes with a tall Infinity display with an aspect ratio of 20:9. Regarding Samsung Galaxy A70’s specifications, the smartphone has a 6.7-inch Infinity-U display. It must be noted that Samsung’s Infinity-U display is mostly similar to Essential Phone’s as well as Redmi Note 7 series‘ notch. As we already mentioned, this display has an aspect ratio of 20:9 which gives “immersive viewing experience”. This AMOLED display has a resolution of 1080 x 2400 pixels. On the inside, Samsung Galaxy A70 is powered by an octa-core processor along with up to 8GB of RAM. However, Samsung is yet to reveal the exact processor used in this device. We expect Samsung to include an Exynos 7800 series processor on this smartphone. In terms of internal storage, the device has 128GB of in-built storage. But you also get a microSD card slot which further expands the storage up to 512GB. On the back, Samsung’s Galaxy A70 has a triple camera setup which seems to be the trend this year. This triple camera setup has 32MP+8MP+5MP sensors. This setup consists of a primary sensor along with an ultrawide and depth sensor respectively. Along with that, there is a 32MP selfie camera on this device too. Galaxy A70 also has a 4500 mAh non-removable battery along with fast charging support at 25W. Another highlighting feature of the Samsung Galaxy A70 is its in-display fingerprint sensor. But we are not sure at the moment if it is an ultrasonic or optical one. Samsung’s Galaxy S10 series has ultrasonic fingerprint sensor which works even in low-light and with wet hands. Samsung is planning to launch the Galaxy A70 in 3 continents at ‘A Galaxy Event’ on April 10th. Stay tuned for the pricing & availability as we’ll keep you updated.